Brake hoses such as article 7.16949 are safety-relevant components and should be tested during any vehicle maintenance. They are used as flexible connections at moving points between the body and chassis and serve to transfer the brake fluid. 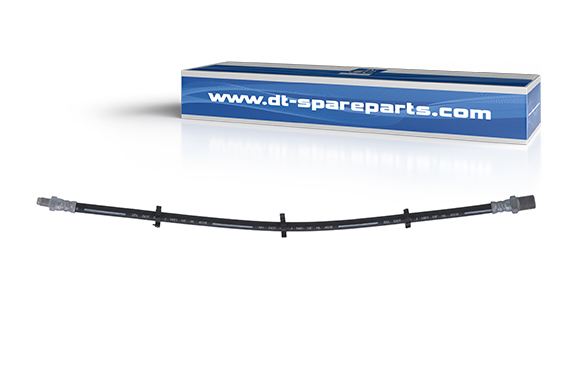 DT Spare Parts brake hoses comply with DIN SAE J1401 and therefore meet huge requirements in terms of compressive strength, load capacity and durability. The brake hose 7.16949 consists of a special rubber compound and an internal braiding which serves as a significant reinforcement. Mounting brackets and precisely fitting connecting pieces enable perfect installation. Before renewing the article, the equipment must be checked for contamination, water content and, if necessary, rinsed. The new brake hose is screwed manually into the thread on the side with the external thread and mounted with the torque specified by the manufacturer. 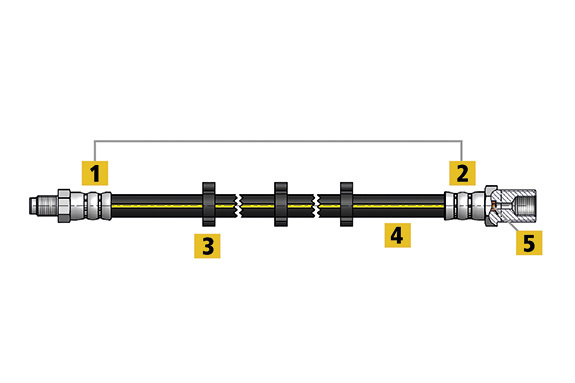 Then the brake hose with the three holders must be aligned tension-free and care must be taken that no chafe marks can occur on the brake hose. After the other side has been fitted and the brake system vented, a final leak and function test must be carried out.